Riverside Estates is a country estate guest lodge in Cape Town ideal for a wonderful getaway or conference base in the heart of beautiful Hout Bay. Honeymooners, families and discerning business guests will love the ambiance of Riverside Estates, a guest lodge within Cape Town with delightful self-catering. Situated in 5 acres of rolling tropical gardens, Riverside Estates is the perfect place to hold a conference or a wedding in a beautiful valley between the mountain and the sea. The conference centre at this elegant accommodation in Hout Bay, Cape Town, can hold conference groups ranging between 4 and 120 delegates. There is also an elegant function venue separate from the conference venue perfect for hosting banquets, events or functions like weddings. 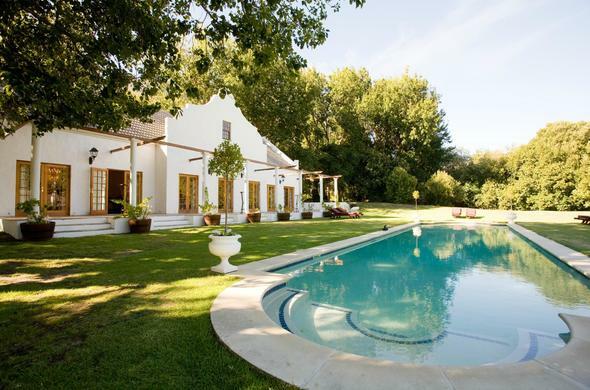 Apart from the main building, the garden, gazebo and poolside area are ideal for breakaway sessions. Riverside Estates features a beautiful spreading 5-acre garden for those morning walks with the birdsong in the background and a tastefully decorated breakfast room where guests can indulge in tea or coffee with freshly-baked croissants. Riverside Estates has 3 lovely swimming pools, a mountain stream that runs through the property, and a gazebo for guests to enjoy. This Hout Bay accommodation is just 30 minutes from the centre of Cape Town and the V&A Waterfront.